This little sucker isn't particularly well regarded, for good reasons. It wasn't when it was originally released, and it seems to diminish in value each year. A good example would be the 79% score in Zzap!64 magazine, compared to the measly 5.8 from 20 votes at Lemon64. And that's the best score I've found! 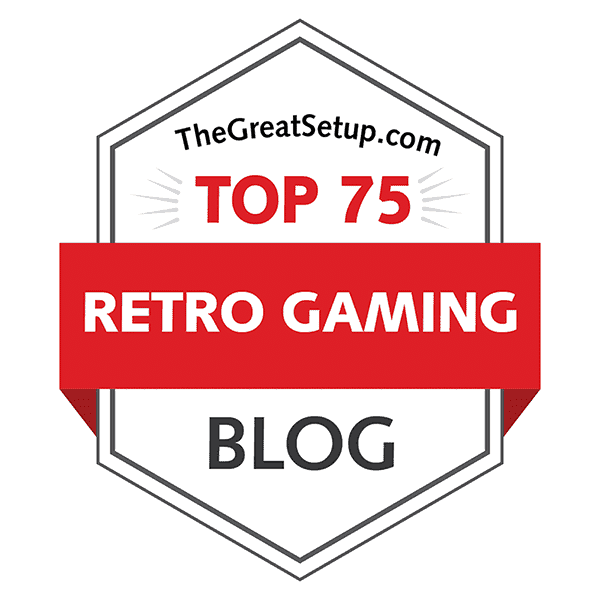 At World of Spectrum, the game has got 16 votes with a nicely rounded 5.0 for a score, and 11 voters at LemonAmiga have rated their version with a horrible 4.36. At CPC Game Reviews, the game has a whopping 2 out of 10, and the DOS version has only one vote anywhere I've seen, so I don't know what to make of it. Seems like a proper stinker all around. What a way to end this year with, eh? You are Santa Claus. That's what the game was originally called, when it was first previewed, and I don't know why it couldn't have stayed as such, because there are too many games beginning with the letter 'S' already as it is. Perhaps calling the 8-bit game as such would have given more reason to call the 16-bit game Santa's Xmas Caper, or Christmas Capers or whatever it is called wherever - yes, there is some inconstancy to that, but let's focus on what the two versions of the same title actually are like. Let's start with "not good", because none of the versions really are. That's what they have in common. 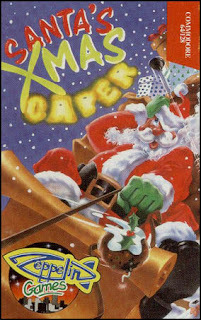 The 8-bit game is a side-scrolling shoot'em-up, and at least the C64 version features some sort of a long-winded plot description about Santa having had too much wine-enhanced puddings, so your job is to save the Christmas. The 16-bit game is a multi-directionally scrolling platformer, but apparently the good folk at Zeppelin were not very aware of their game having been completely remade into something totally different, so the text on the box is very much the same as it is in the original. This lack of attention to their own product shows an appalling manner to treat their potential customers. But nevermind that, I'm not here to talk about cover art. Both games are in all their outings simplistic and brainless waste of time specifically designed for those gamers who like to play something seasonal, but don't want to waste any time in learning anything complex. These sorts of games work fine as a gift for a game collector, since it's something nobody in their right mind would actually buy for themselves, but still would be happy to have a new addition into their collections, because one would rarely play either of these games after the first attempt. My guess is, this reason is exactly why Zeppelin Games decided to make the 16-bit version completely different, so they could revisit their old Christmas title without too much thought put into it, and give the 16-bit gamers their own version of the special collectors' item. With plenty enough of other Christmas-themed games out there already, in which you play as Santa Claus, I'm surprised they couldn't come up with anything better. After a few minutes of playtesting each version, the title feels like the most interesting part of the game. But, since all the versions are quite bad to start with, it makes it all the more interesting to find out, which ones are the least horrible ones of the lot. Let's start with the first one by the release date, since we have to have some sort of a point of comparison. In the C64 version, you control Santa in his sleigh pulled by one of his reindeer (not Rudolph) through three stages filled with Minteresque enemies and other obstacles. Your job, naturally, is to shoot everything possible in sight and avoid everything else that you might crash into. This doesn't sound like too much of a bother, but the game throws quite a lot of stuff at you at all times, and sometimes it's difficult to know which sprites are enemies and which are their bullets, and later on, also difficult to tell which background elements you should avoid bumping into and shoot instead. As with most shooters, it's a simple matter of trial and error. At least the playability isn't too bad - Santa is very easy and sharp to control, and you can only shoot ahead of you, so there shouldn't be too much to focus on, at least gameplay-wise. That could also be considered one of the bigger problems of the game, because ever so often, you feel a great need to drop bombs or shoot upwards or something. The overabundance of enemies and narrow places to navigate through makes this an unnecessarily difficult game, and you get no real incentive to get through the game, because the ending is even cheaper than the game itself, and all three stages are basically the same thing over and over again with different graphics. 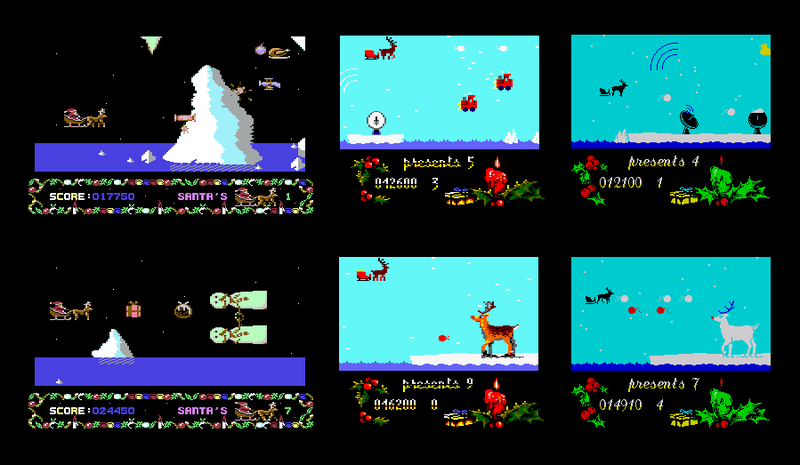 The versions for SPECTRUM and AMSTRAD are a bit different, although the basic idea is still the same: you ride the sleigh, shoot at enemies while you avoid getting hit. For an extra mission, you have to collect presents from mid-air, and drop them at their designated places, which I'm sure you can figure out by yourselves when you get to it. Although the playability differs in the amount of movement space on the screen as it does in choppy scrolling compared to the C64 game, the general difficulty level is surprisingly similar. Granted, the C64 game throws more stuff at you at more constant intervals, but the SPECTRUM/AMSTRAD version manages to make up for the relative lack of mayhem with less movement space for the most part. That said, this twosome is slightly more playable, and even more probably completable than the C64 game, which is something worth considering. Whether this is enough to make it more enjoyable is another matter entirely, and in that, I'm sorry to say it really isn't. So, how does a platform game compare to a shoot'em-up game - are there even any similarities at all? Actually, I think you could say that there are. Although the platform game was released only on the 16-bits, it still oozes a similar mediocrity as does the 8-bit game, because both interpretations of Santa's adventures are almost impossibly difficult to play in more than one way, and the controls are as stiff and basic as they are in the shoot'em-up. In a way, the 16-bit game is a shoot'em-up, since it involves throwing snowballs as much as the 8-bit game does, but in a platforming environment. But then, you could as well say that of Super Mario Bros., so the argument is hardly valid. I have a tendency to take Super Mario Bros. and The Great Giana Sisters as the points of reference also when talking about jumping mechanics in platforming games, because the ability to adjust your jumping height is something you have come to expect from these games, as a norm of sorts. 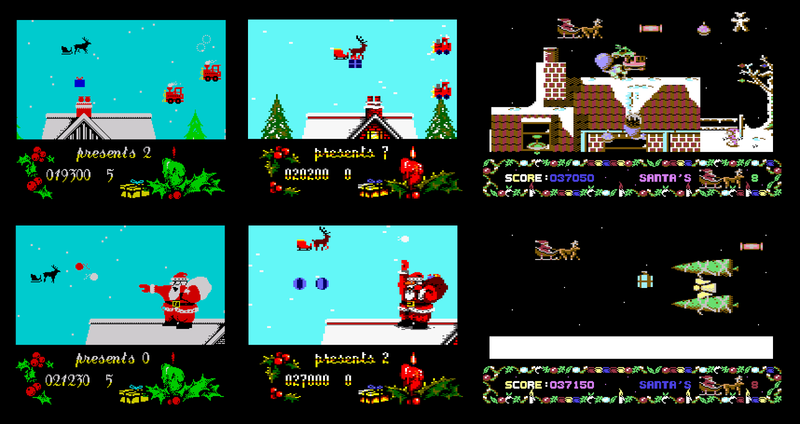 In Santa's Xmas Caper, the jumping feels closer to Manic Miner and the likes of its time, as Santa is only able to jump to a certain height, although at least in here, you can control him left and right in any required manner within the given limits. As for the game's other aspects, there isn't all too much to tell, really. You just run and jump over solid and moving platforms, whichever you can determine each of the said platforms are, pick up all the presents to proceed to the next level, and other items for score, throw snowballs at enemies to keep them from attacking you, avoid everything else, and get to the end of each level, where a big present is waiting for you. The only other helpful items in the game are a bubble-shaped shield, which you will have at the beginning of each new life for about 5 seconds or so, and you can also pick the items up once in a level, and an item that has the appearance of Santa's face, which gives you an extra life. oblivion is its rarely utilised subject matter. Considering each version for their basic value as a game, in terms of playability, I would still have to say the 16-bit game wins the fight, because at least it offers some gameplay value in level design and some basic elements you would expect from a game of its genre. The 8-bit games don't have much of that, I'm afraid, but then they are really basic shoot'em-ups. From the 8-bit games, though, the C64 version wins based on two important factors: unlike the SPECTRUM/AMSTRAD version, it has an ending, and due to smooth scrolling, it is more comfortable to play. I think it has been pretty well established that this game is nothing if not mediocre. So can you expect anything more from its graphics than mediocrity? Well, you might be surprised. Let's start with the loading screens, since that bit was skipped earlier, but the title menus will be included in the mix as well. 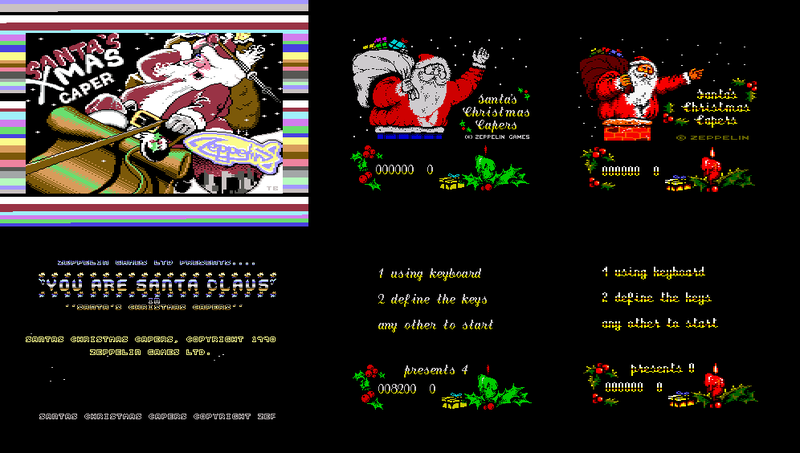 From the 8-bit versions, the C64 original is the only one to feature a rendition of the cover art as the loading screen, while the other two just show Santa Claus in some sort of waving pose, strangely a different one for each SPECTRUM and AMSTRAD. Also, the title for the latter two is "Santa's Christmas Capers" instead of the more official "Santa's Xmas Caper", but who cares. Once the game has loaded in, the C64 version starts off with a cheap title screen with lots of text, plenty of visual effects and a scroller at the bottom, but the AMSTRAD and SPECTRUM versions appear cheaper still, with the loading screen acting as the title screen, and the main menu being very basic with nothing new to show. I'm not very sure which one is the preferred choice, because it's always nice to have a picture for a title screen, even if it is the same as the loading screen. Then again, having the game's credits properly shown with other information is a good alternative as well, as long as it doesn't look completely boring. Now we get into the game itself. 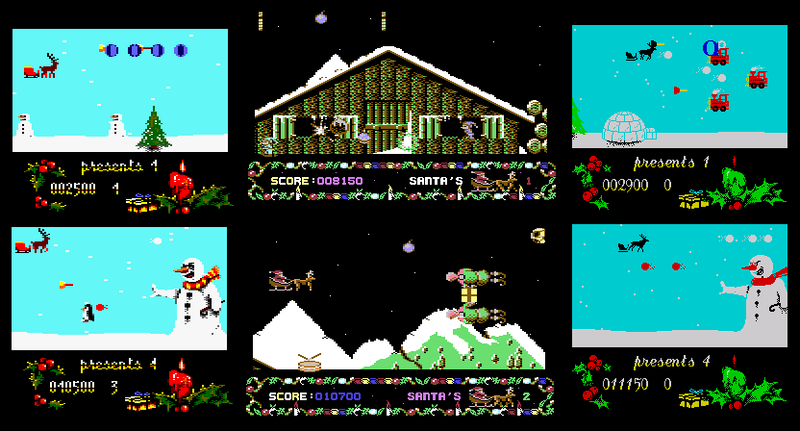 Although I have only included two screenshots from the whole of level 1, which is supposed to represent Lapland (which, again, is sorely misrepresented), you do get a fairly good idea of how diverse the level graphics are for each version. The C64 version has quite a bit of diversity in the graphical content and level design, while the AMSTRAD and SPECTRUM versions only have some random trees, igloos and snowmen lined up before the final boss. But the end level bosses are quite a lot better looking on the SPECTRUM and AMSTRAD versions - just for being properly aligned, they look better, as the sideways-shown end-level bosses in the C64 version look increasingly ridiculous as the game progresses. If that doesn't convince you, they are better drawn as well, so you can actually see straight away what you're up against. In case you're wondering, the C64 end-level bosses are two elves, two snowmen and two pine trees with a decorative angel in between them. I'm sure you can figure out the Amstrad and Spectrum equivalents on yourselves. Since I started with two screenshots for a level, I might as well continue in the same line. Something that's also worth noting is that the action screen is much smaller on the SPECTRUM and AMSTRAD version of the game compared to that of the C64, which for the most part explains the relative lack of movement space. Still, even with a smaller screen, the scrolling is quite nudgy and uncomfortable, since it's based on the basic character width, which is 8 pixels, if I remember correctly. Although the nudgy way of scrolling is familiar from other Spectrum games, it doesn't make it any less bothersome that everything looks less natural in their movement, and thus harder to avoid and aim at, compared to the smooth scrolling on the C64 version. Graphically, the biggest difference between the AMSTRAD/SPECTRUM version and the C64 version is the overall style. The C64 game is dark in tone, but has plenty of Jeff Minter-esque elements that make the action feel more chaotic than it actually is, such as alternating sprites for your bullets and often topically unrelated things flying around and trying to kill you. The other game is much lighter, with a clearer and brighter wintery overall colouring, with clearly designed sprites for everything, but clearly less content to show off with. To end the 8-bit section as a short recap, the overall style of the AMSTRAD/SPECTRUM version is more fitting for the seasonal content, but when you consider the idea that Santa has been consuming some alcohol prior to the action here, the C64 game's graphics are more understandable. I do like the other two's graphics better, but following the plotline makes the C64 version more fitting. Also, the C64 version has better scrolling, a bigger action screen, an actual title screen and much more content, so it's a no-brainer. But as to which one looks better - the AMSTRAD version or the SPECTRUM one, I cannot say. The colours are much better on the AMSTRAD version, but the hi-res graphics look nicer on SPECTRUM. I guess it's a tied spot again. Title sequences from Commodore Amiga (top row) and IBM-PC compatibles (bottom row). The "Starring" sequence is shown in its displayed order in the middle. Apart from the absence of Zeppelin's own intro screen on the DOS version, both 16-bit versions start off similarly enough. You get a nice pixelated rendition of the cover art, and then the title screen with the "Starring" credits and seasonal greetings from the Zeppelin team comes with the snowy cabin-on-a-mountainside background. As the AMIGA has a higher screen resolution, you can see more of both the loading image and the background image in the title sequence, but the DOS loading screen uses some nice shading that could have well been made for the AMIGA version, but wasn't. This is probably the most impressive part of the whole game, and gives you reason to believe that something wonderful is coming up. The Christmas card that repeats itself. Left: Commodore Amiga. Right: IBM-PC. 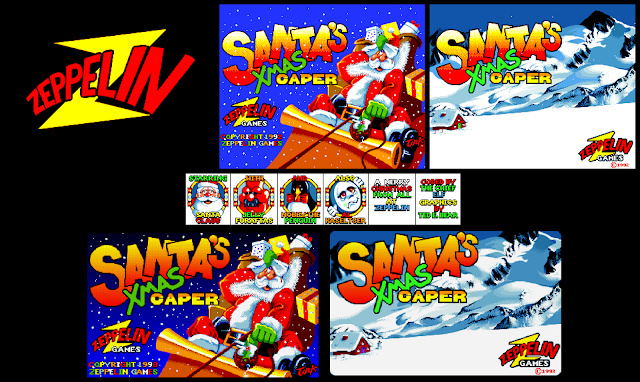 For whatever reason, Zeppelin decided to include this increasingly bothersome Christmas card at the beginning and the end of each level. The reason why it's so bothersome for me is, that it's always the same, and it takes a while to pass. After the first time you have seen it appear, it's nothing more than a nuisance. Sure, it's scenic and nice, just like a Christmas card attached on your refridgerator with a magnet, but does any of you honestly take another look at them once you've received them and attached them on your fridge - or wherever? No Sir, I don't like it. And they don't even offer anything to comment on in terms of comparison. Screenshots from level 1. Top row: IBM-PC. Bottom row: Commodore Amiga. The most immediately noticable difference in the in-game graphics is the background colouring. The DOS version has a default background colour pattern of alternating blue and black lines with gradient blur between them, while the AMIGA version features a different gradient colouring for every level with no alternating lines, but a proper gradient from top to bottom instead. Level 1 has a blue gradient with some pink at the top, level 2 has a green gradient going from white to black at the extremes, level 3 has a blue gradient with some green at the top, and so on and so forth. You get the picture. Screenshots from levels 2 (left) and 3 (right). Top row: Commodore Amiga. Bottom row: IBM-PC. The other really big difference is - once again - the screen size. In the AMIGA version, you can see more at once, as the action screen has more height. Although it affects only about half of the levels in the game, and perhaps less, it is still an important bit of screen space. The only other notable difference is the way the info panel has all the numbers displayed, and in this case, I'm more comfortable with the DOS version, because in the AMIGA version, the numeric slots are not filled with zeroes when there are no other numbers to be found, and the alignments of the empty bits are a bit inconsistent. What do you think you're going to hear in a Christmas-themed game? Well, for some part, you would be correct - there are plenty of those old warhorses of Christmas songs to be heard in more or less unremarkable renditions here, but there are some rather nice surprises in store here. At least in the C64 original, the tunes are well programmed and even manage to sound fresh. Also, in addition to "Joy To The World" and "Jingle Bells", Mark Wilson has included a rendition of a rather rarely heard Christmas song in a computer game: Greg Lake's "I Believe in Father Christmas", which is a nice surprise. Wilson has put the SID chip to good use here, with plenty of rhythmic elements and subtle arpeggios to fill the space. In addition to the tunes, there are some unremarkable sound effects that play on top of the music, which are okay, since they don't intrude on the music too much. The SPECTRUM version has very simple beeper renditions of some other tunes, with slight mistakes in melodies, such as minor-scale based intervals within a major-scale melody, slight rhythmic problems and so on. I recognized at least "We Wish You A Merry Christmas" as the title screen tune, and "Silent Night" played at the end of level 1, but the other two tunes I didn't recognize. As they seemed to be just as basic Christmas songs as the other two tunes, their faulty representations took out any enjoyment one might have from listening to Christmas songs coming from a beeper, unless you have a fetish for that sort of a thing. The only sound effect in the game is when your snowball hits something, which is indicated by a sort of plop-sounding crash noise. Cheap production all the way. Perhaps I shouldn't be too surprised, but the AMSTRAD version sounds very similar to the SPECTRUM version, with the only notable differences being that all the music has a second tone playing some sort of a background thing, which is rarely melodically correct, and that the plop-like snowball sounds are slightly more aggressive due to them being reproduced on an actual sound chip. Taking that into consideration, perhaps the Amstrad version is even less impressive than the Spectrum one, but it does have something more, so I'm willing to consider the two pretty much equal. Yeah, whatever. Giving scores is useless in this case, but there you go. Since there were three notably different games under inspection here, you might as well test all the games and their versions by yourselves, but I strongly urge you not to. If you want to have any actual enjoyment out of any of this lot, do yourselves a favour and choose the AMIGA version, because it has some really nice music. Or, if you want to have a laugh at badly programmed music, the AMSTRAD version should entertain you for a while. That's it for now, thanks for reading! Next year, back to some good games and other adventures in retroland! Merry Christmas and a happier New Year!